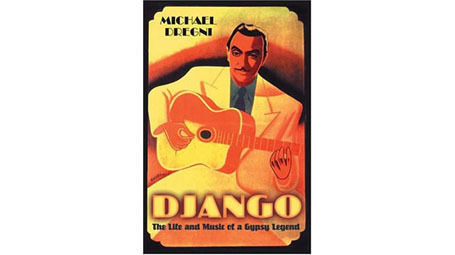 In this carefully researched biography, rich with details from interviews with family members, friends and musicians, Dregni, a writer for Vintage Guitar magazine, brings legendary Gypsy jazz guitarist Django Reinhardt (1910–1953) into the spotlight. Born in a Belgian caravan, Django began performing in Parisian dance halls at 12. In 1928, after a fire turned his left hand into a clawed hook, he learned to work the frets with just two fully mobile fingers, creating new chord forms and playing with stunning dexterity. With his brother and three other musicians—including celebrated violinist Stéphane Grappelli (staid, suave, classically trained, Stéphane was in many ways Djangos opposite)—he formed a string jazz ensemble, Quintette du Hot Club de France, which started informally in 1934 and was, by 1937, nearly "falling apart under the strain of [its] own genius." But they kept playing, and their fame spread. Spared by the Nazis because a German kommandant liked his playing, Django became a national hero when one of his compositions, "Nuages," became the unofficial anthem of occupied France. Dregni casts Django as a mercurial, charismatic Romany innocent, alternately transfixed by gadjo life and dismissive of it. Colorful descriptions of the nightclubs of jazz-age Paris and sensitive appraisals of Djangos musicianship add to the books appeal.